I hear all the time..there are no good men left. It’s hard to find a good man. See as the feminist movement roared in, we …women…felt empowered. We felt we could move a car, build a house, bring home the bacon and handle all the affairs of our home and work life. We became offended that those …men… Would want to…gasp!…help pick up something heavy, ask us to stay home to take care of our children so they could….oh… my…word…take care of us!!!! How dare they view us such weaklings!?! I mean we are just as smart, just as strong ..we deserve the same pay.. We deserve to be treated as equals!!!!! Then a few years ago I started to notice something. Fewer men asked to help me put heavier bulky objects in my car at the store. Men don’t offer the seat to a woman any more. Fewer men held the door. As my daughters started to date, fewer young men came to the door, or wanted to pick up the ticket. I recalled time after time as a young adult when a man would ask if they could help. With the idea that I am a strong woman in mind, I refused. See even as moms, we coddle our sons. They NEED to know how to do basic car stuff and how to fix things around the house. They NEED to know we expect them to treat woman with kindness, and that chivalry is noted with high honor. Some of the strongest marriages I know are that way because the wife calls out the chivalry with respect to her husband, THAT translates into love and kindness toward their wives. You want to know where the good men are? They are all around you, right under your nose. They have hard wiring to come to our rescue. We have hard wiring to be protected. It is a multifaceted thing, as far as how this became reversed. So, you want to see more chivalry? Allow room for it. Next time you are asked if you need help… Say, “Yes please! I’m so glad you asked!” I don’t care if its to put a ten pound bag of sugar in your trunk. 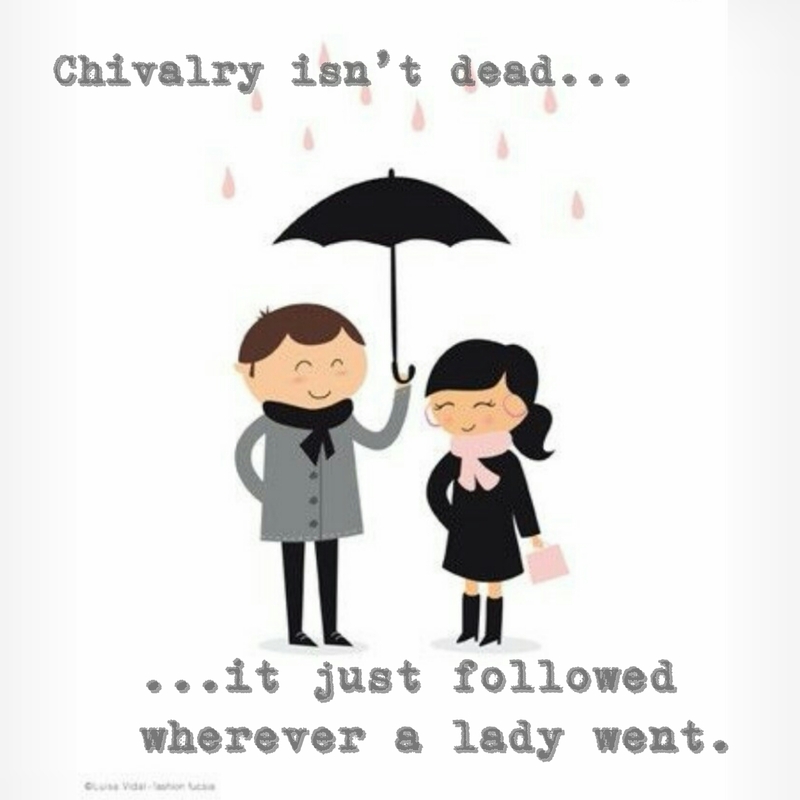 Call out those things of chivalry and respect….especially in our young men. Soon, you will start to recognize all the “good men” around you. They are there! I promise! **Side note. My husband was a little irritated I didn’t call him about the flat tire, until he heard I had our son do it. Does your son know how to change the tire or check the oil on their car? He should.